Season Five: Luke and Dean are shifting Taylor Doose’s cannonballs (dirty!) and moving boxes at the old Twickham house from Taylor’s oddly spellbinding diorama. Judging by his hair – and we always judge his hair – Dean recently had a run-in with a 1970’s blow-dryer. 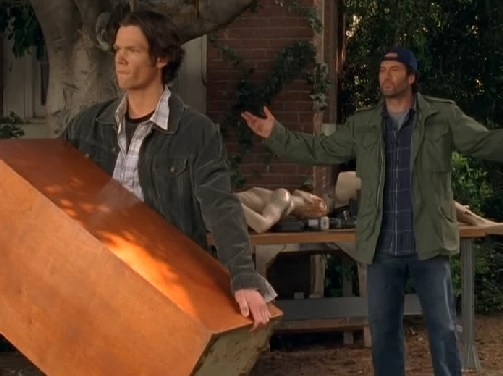 In this, Dean’s final appearance in the Gilmore Girls‘ lives, he is at his most bitter yet most philosophical. He has gained and lost Rory (to Jess), only to regain and lose her again (to Logan) and can’t help but measure his lot against Luke’s nascent relationship with Lorelai. Dean: They want more than this. Don’t you see that? And all you are is this. Dean: You accept it! This town is all you are and it’s not enough. She’s gonna get bored and you aren’t gonna take her anywhere. You’re here, forever. Dean: It’s not different. You and me. Same thing. Like a lot of TV and movie love stories, we see the good bits – the flirting and the getting together and the temporary breaking up before the second coming – but we don’t see what happens in the end. Maybe Dean went back to college, enrolled in some clinical testing to help pay his way, becomes a think-tank boffin and makes and marries a Rory clone. Maybe Luke’s ex-girlfriend Rachel moves back to Stars Hollow and is able to give Luke the reassurances and stability he needs – then gets knocked up immediately so he can’t back out. Where I’m going with this is: What if Dean was right about Luke and Lorelai? We mostly acknowledge that Dean was a great first boyfriend for Rory but ultimately wasn’t the one and Dean is coming from a dark place – with his post-Rory mess of a love-life. However, he speaks from his own personal experience and despite the Bop-It Incident, I question whether he’s saying these things out of spite, to hurt Luke. I wonder whether he’s trying to be a bro, to save Luke some heartache. If Luke and Lorelai became a long-term thing, which one of them would have to change more? Or is Dean just plain wrong? Not the same thing. Lorelia had opportunities to leave or change … new home with Christopher, travel if franchised Dragonfly … she loved Stars Hallow and had made several comments about never wanting to leave or even sell her house. Even E&R knew she would want her home in SH city limits. Not the same, Dean, sorry. Maybe they are the same thing… in some ways. But one thing Dean didn’t take into account is that Lorelai could have had more. She has always had that option. She chose to make her life in Stars Hollow. I think that Dean is saying these things neither for spite or to help Luke but because he believes it is true. However, I also agree with Calil and Krista – that he’s wrong. Lorelai has made her choice and it’s Stars Hollow. Rory is still choosing and, at this point, has reached the stage – as Rick says – where it is clear Dean isn’t The One. As everyone else has pointed out, Dean was flat out wrong…about Luke and Lorelai, about himself and Rory, pretty much spot on. Rory and Lorelai aren’t the same. But Dean and Luke are similar. Both are confortable with having a simple life in a small town. Rory is going to conquer the world and Dean would be no pair for her. Lorelai is happy at her house and unless Rory marries a British guy and moves to England, I don’t think she would ever want to leave Stars Hollow. I do think Luke is too small minded for Lorelai, he’s sweet but he would drive me nuts. She did get an offer to sell the Dragonfly and didn’t take it, but that doesn’t mean that it wouldn’t happen in the future. To me, it always seemed like Dean was almost talking to himself (or, rather, that season 5 Dean was talking to season 1 Dean) when he said those things to Luke. Having said that, there are many similarities between Luke and Dean. They both represented the blue collar type of guy, they both married someone else while being aware that their heart was somewhere else, they both were deemed unworthy by Richard and Emily…..The main difference between them, in my opinion, is that it took a lot for Dean to accept things just wouldn’t work out between Rory and him. Luke, on the other hand, often seemed already convinced that his relationship with Lorelai didn’t have a chance. Or very little. He seemed much less confident, at least. As for Luke and Lorelai being a long-term thing……sadly enough, their relationship was the most stable and lasting one for both of them. But they both should make a huge change of attitude to make it work, and judging by the way they communicate (or, rather, by the way they don’t) by the end of the last episode (despite the kiss and cute exchange at the very, very, very end), the chances for that relationship to really work seemed very few. And Rich, your idea of bringing Rachel back already crossed my mind. I really liked that character and was disappointed to never see her come back (at least for a couple of episodes). I would have loved to see her back with Luke on the last season, instead of seeing him turn into the sad, heartbroken guy unable to move on from his feelings towards Lorelai while she was with Christopher. It would have made his storyline less depressing, I think. And before the Lorelai and Luke supporters start searching for a rope that fits my neck: I really wished to see them end up together (even if the Lorelai and Christopher team can make some pretty good points, as much as I hate to admit it…. ).